Teaser Outdoor and TV: High 5s can be moments big and small. Launch TV: Friendly's CEO (Harsha Agadi playing himself) lays down a challenge. Social Media: Heidi’s High 5 Facebook hub kept track of her quest, attracted High 5s from the public and pushed out content to our growing fan base. 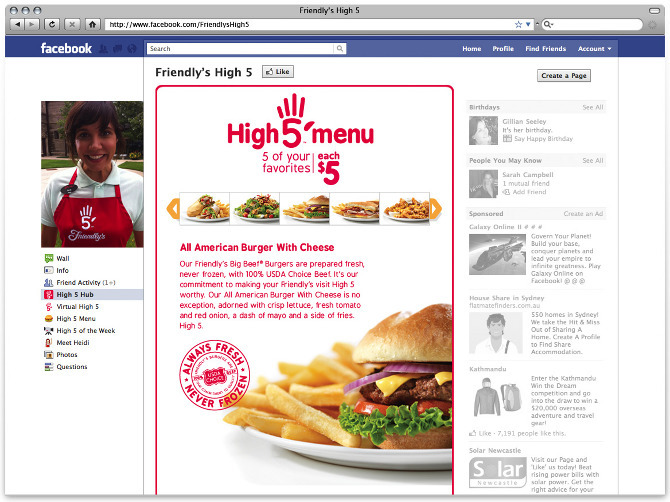 YouTube Channel: Heidi showcased her favorite High 5s on the Friendly’s YouTube channel. In-Store Menu: Our new menus incorporated our new look and feel in store. Street Teams: Heidi’s High 5 assistants were always on the move.